We are illustrating a new type of contractor's steam locomotive, the machinery or engine parts of which are all confined to one unit, so small and compact that it can be installed in the narrowest gage locomotives. The engine unit includes such features as roller bearings, drop forged parts thruout [sic] and the highest grade material and workmanshiip [sic] and all working parts are enclosed in an oil-tight dust-proof case. The boiler plant is extremely compact, absolutely safe, easily cleaned and so designed that all the tubes may be removed and replaced in one unit when necessary in from one to two hours' time. A steam pressure of from 300 to 350 pounds is carried and at this pressure, the factor of safety is at least 10. The boiler may be fired from cold in 10 to 30 minutes, or fired instantly after a one hour's stand. These features furnish the contractor with a locomotive that will run on any fuel, from gasoline and kerosene to crude oil, or coal or wood, a locomotive that will give no smoke or sparks when burning kerosene or fuel oil. This type of Bell locomotive may be started quickly and has the speed of the direct connected locomotive combined with the power of the geared locomotive. 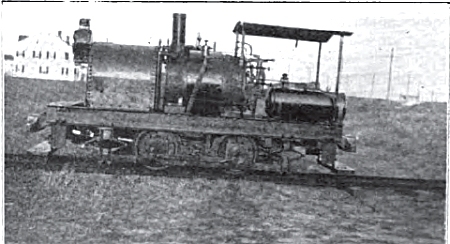 This information was transcribed from the article entitled "New Type Steam Locomotive" that appeared on page 40 of the July, 1917 issue of Municipal Engineering.